It's GREAT, it's FUN, it's Cheeky Weekly issue 88, one week after the introduction of the new look (which will be completed this issue as we shall see later). 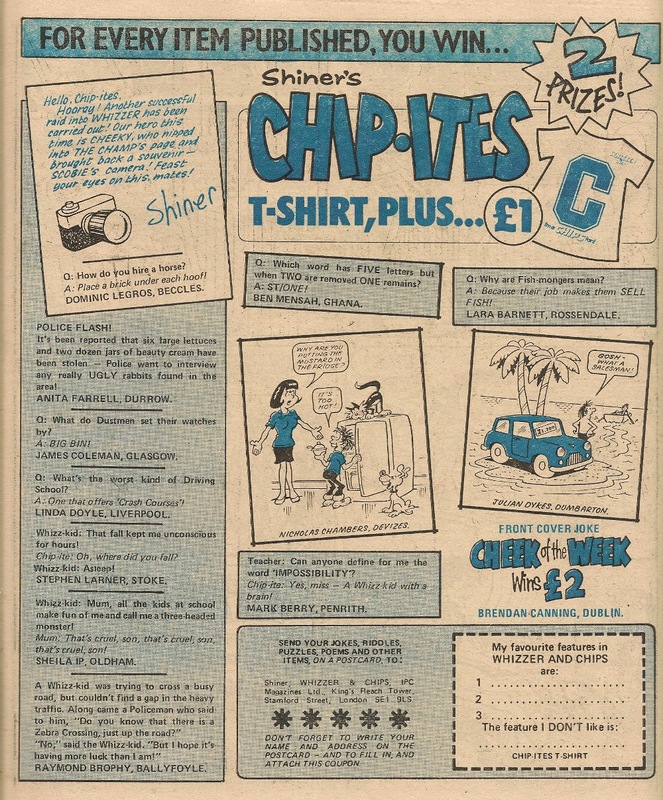 The comic commences with a front-page reminder that, despite the revamp, reader participation features Paddywack, Joke-Box Jury and Chit-Chat continue to offer £2 prizes to successful contributors. 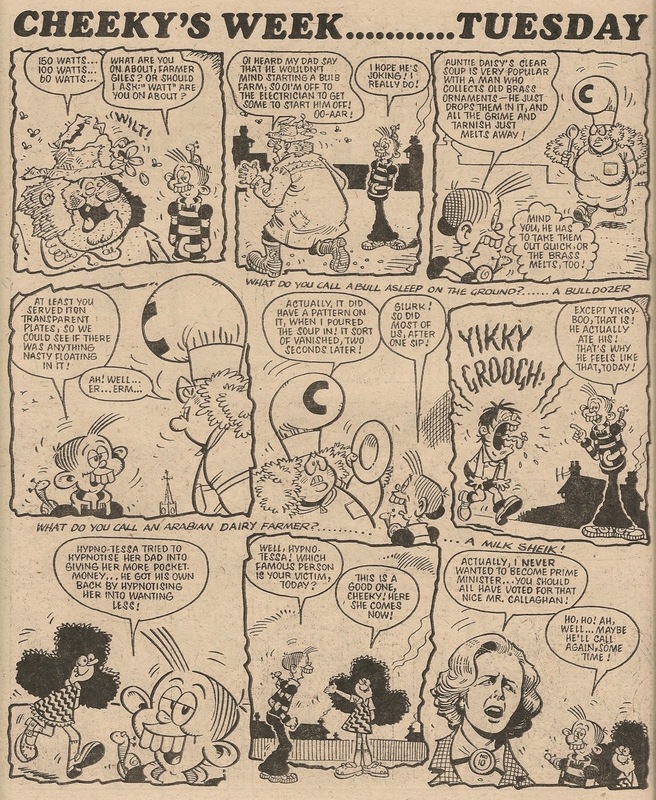 Also on the cover is a Mike Lacey depiction of Cheeky suffering a typically traumatic encounter with Yikky-Boo, in an image sourced from the Thursday page of Cheeky Weekly dated 24 February 1979. 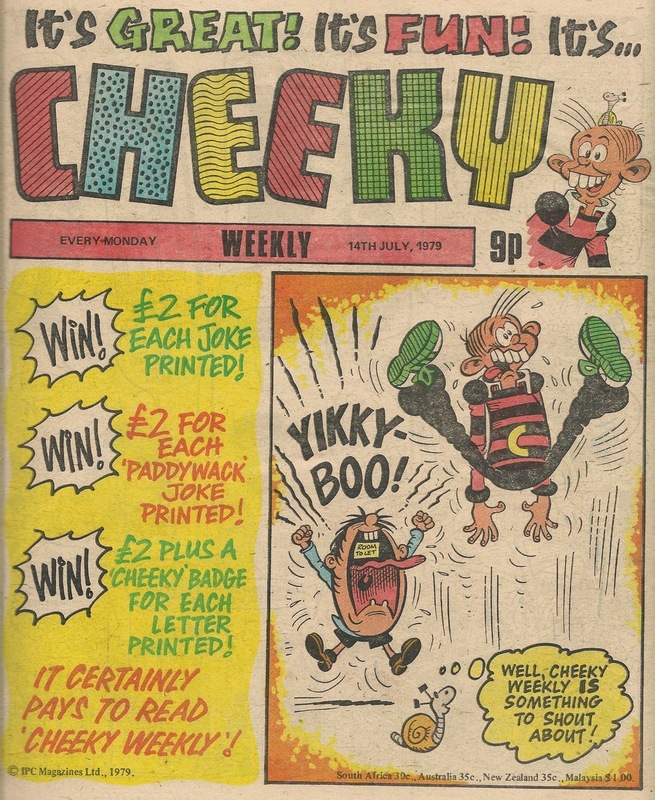 On Sunday Cheeky introduces a new member of the supporting cast – it's Welsh wag Taff the Laff. 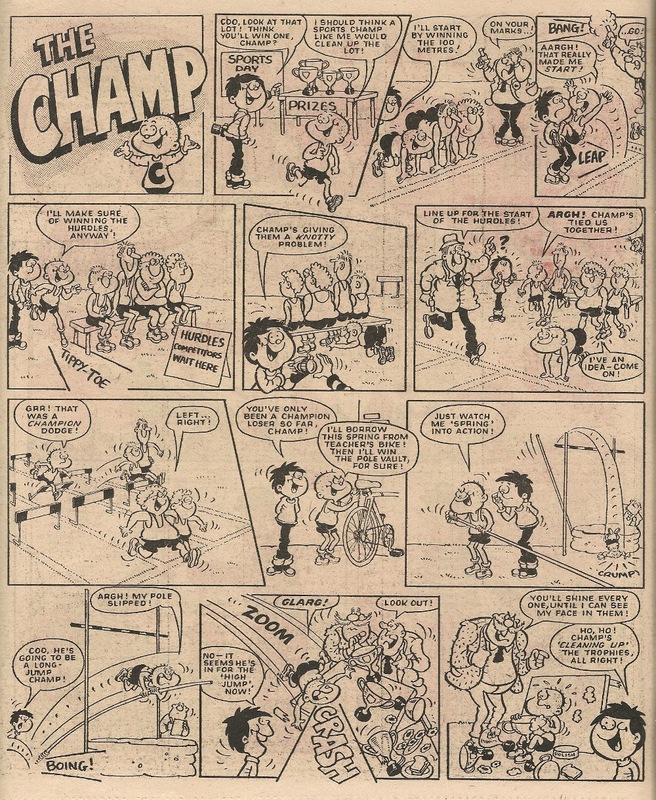 On page 3, Calculator Kid is beset by that dilemma which regularly troubles comic characters – the supposedly inaccessible sporting event. 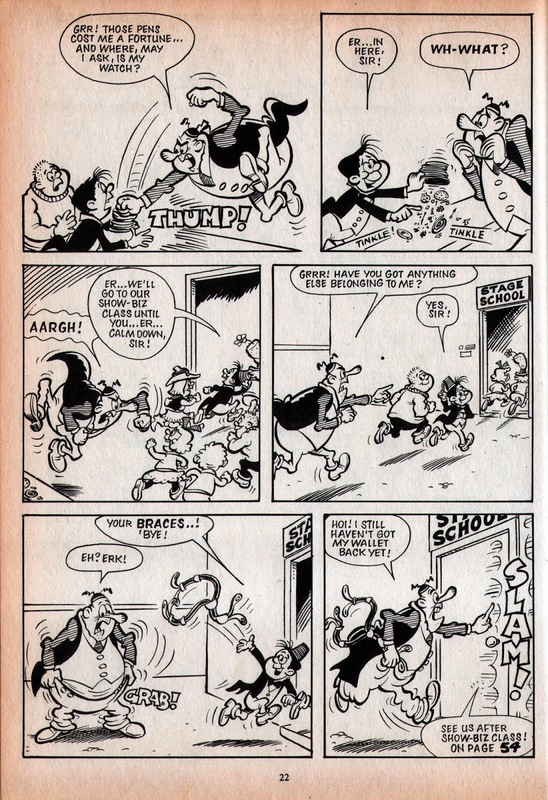 Trust Charlie's silicon-chipped sidekick to devise a method of entry. 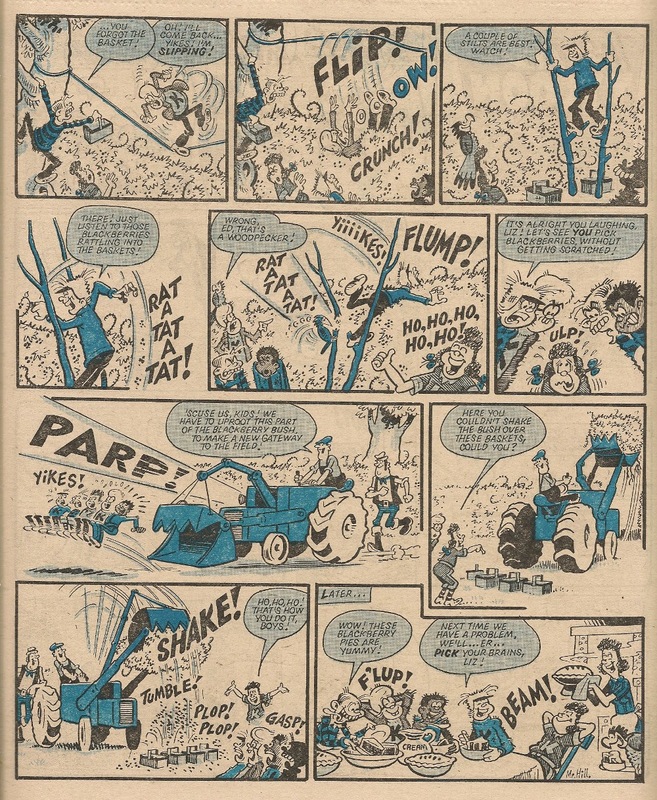 Nigel Edwards deputises for Ian Knox on this week's 6 Million Dollar Gran episode, in which the synthetic senior citizen foils an attempt to divert an aeroplane, by landing a punch on the hi-jacker through the fuselage while the 'plane is in flight. Rather a risky strategy for all concerned but it pays off. 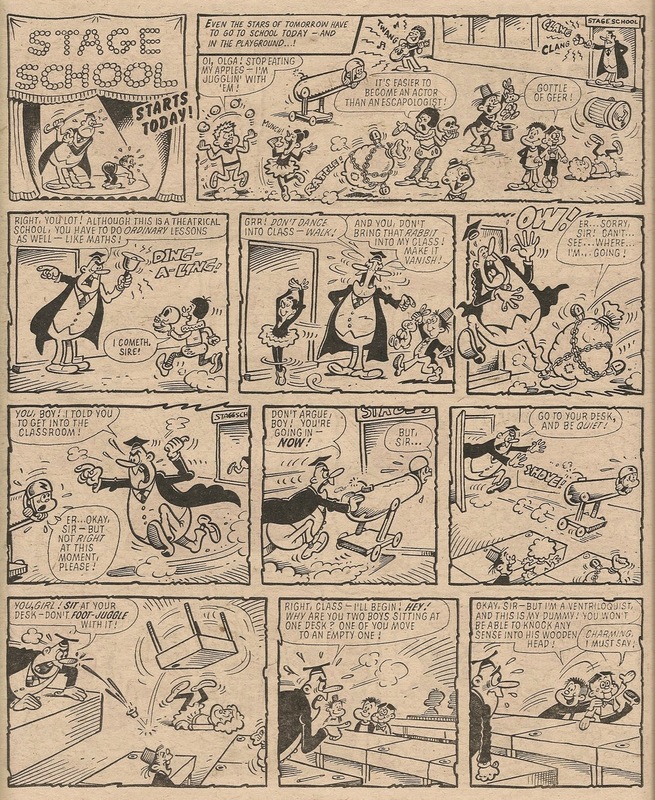 On Tuesday Yikky-Boo is, due to a culinary misadventure, somewhat less ebullient than during his front page appearance. There then follows some hypnotic humour involving new Prime Minister Margaret Thatcher. 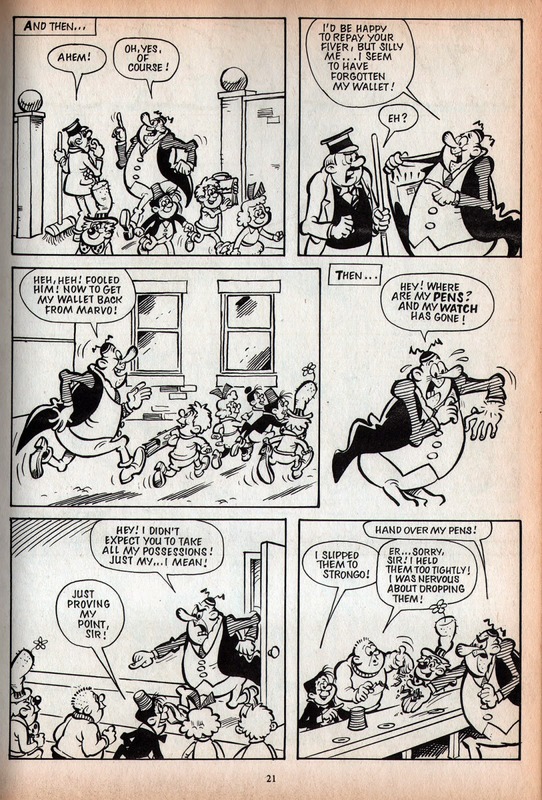 The Conservatives had won the recent general election on 03 May 1979, taking control of the country from Labour, led by Prime Minister James Callaghan (hence Cheeky's concluding joke, which wouldn't work so well as a spoken gag since the ousted PM's name was pronounced 'Callahan'). 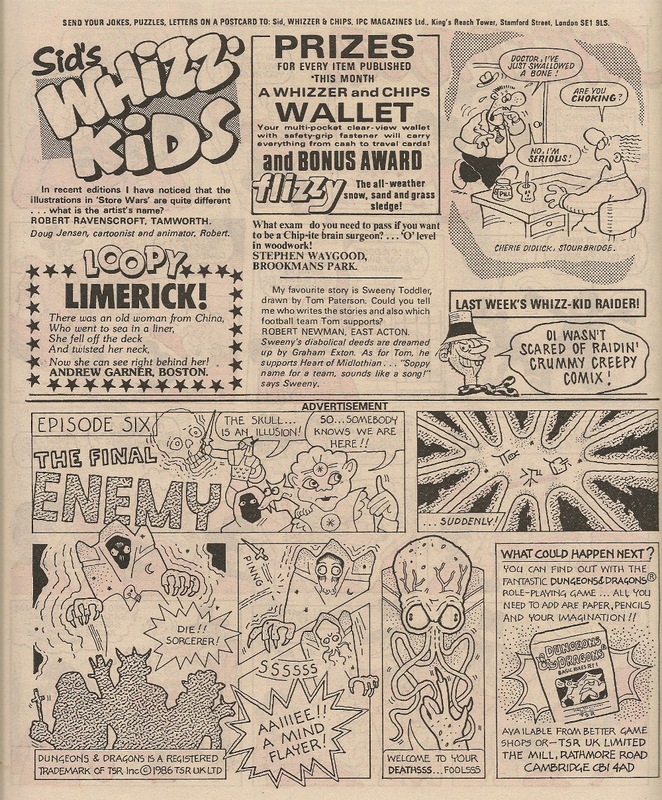 The centre pages are taken up by a colour road safety ad in the form of a comic strip entitled Football Crazy and starring the Green Cross man. 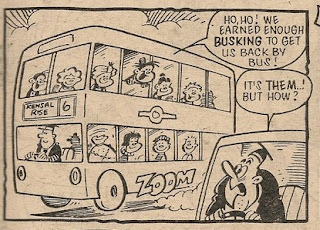 This week's Star Guest is Lolly Pop (with of course his exasperated offspring, Archie), giving his home comic of the time, Whoopee, a plug. 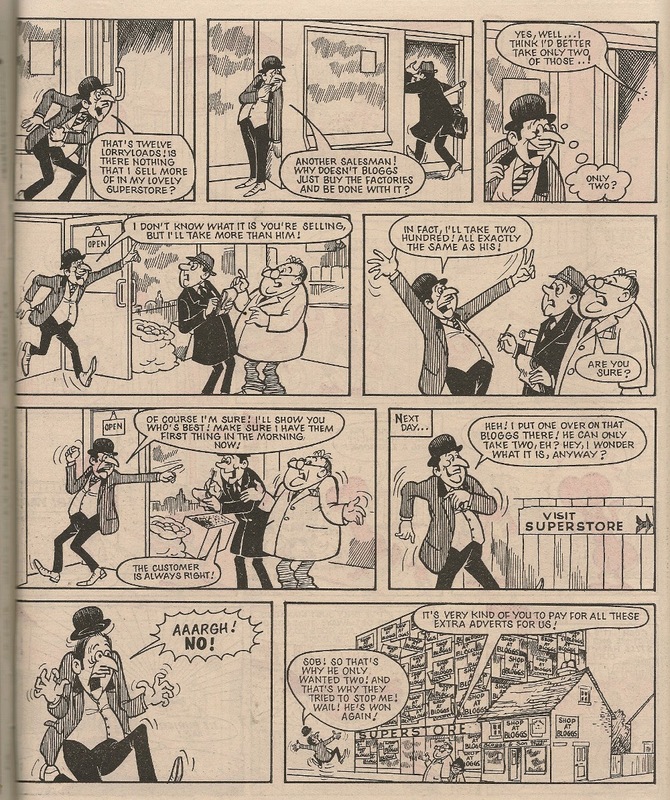 This story, drawn by Barry Glennard, is Pop's second Star Guest visit to Cheeky Weekly – Pop kicked off the Star Guest run back in the special 31 March 1979 issue of the toothy funster's comic, illustrated on that occasion by the strip's then regular artist - Sid Burgon. 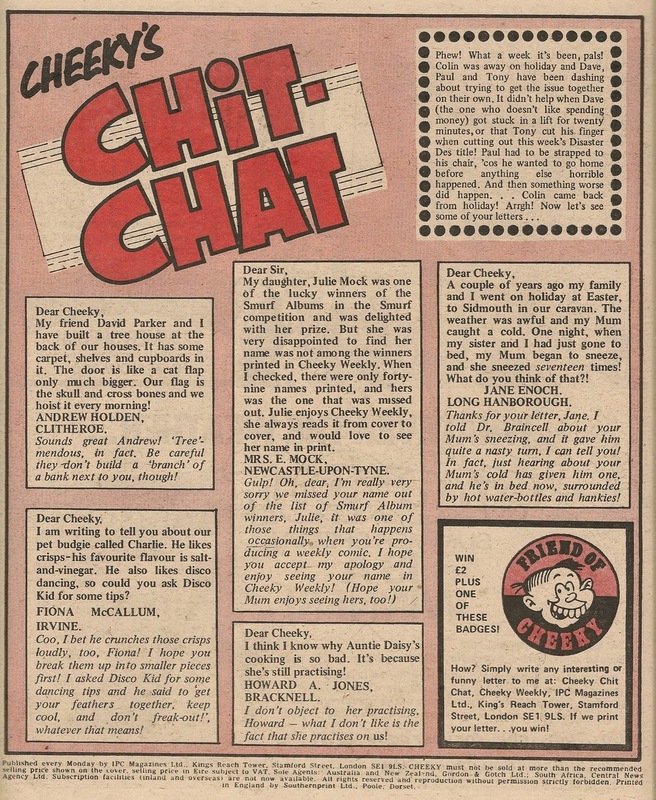 On this week's Chit-Chat page, Cheeky's message gives us some insight into the tribulations of producing a comic, and then the toothy funster has to apologise to reader Julie Mock for omitting her name from the list of Smurf Competition winners back in the 24 March 1979 comic. 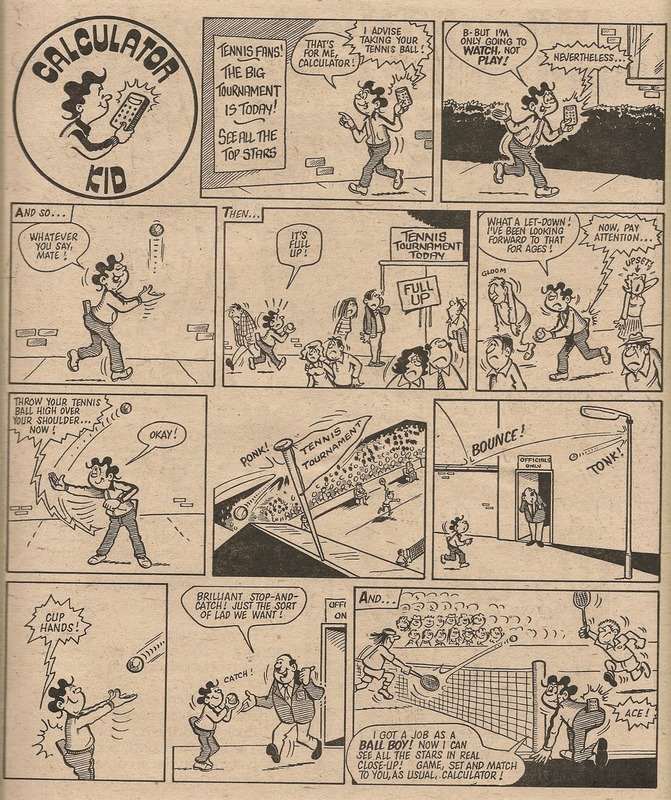 Nosy Nora makes her final Cheeky Weekly appearance (in a non-speaking role), as one of Cheeky's classmates in the second panel of the Friday page. 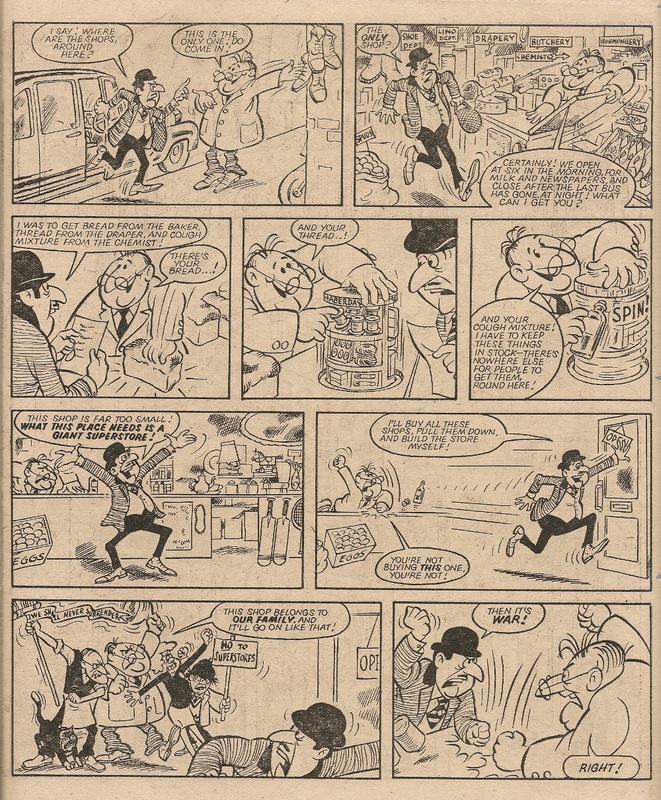 On Saturday Cheeky is sent to do the shopping, and is given an even more onerous task in the final panel where, thanks to some deft copy-and-paste work, he informs readers of impending strain on their pocket money. 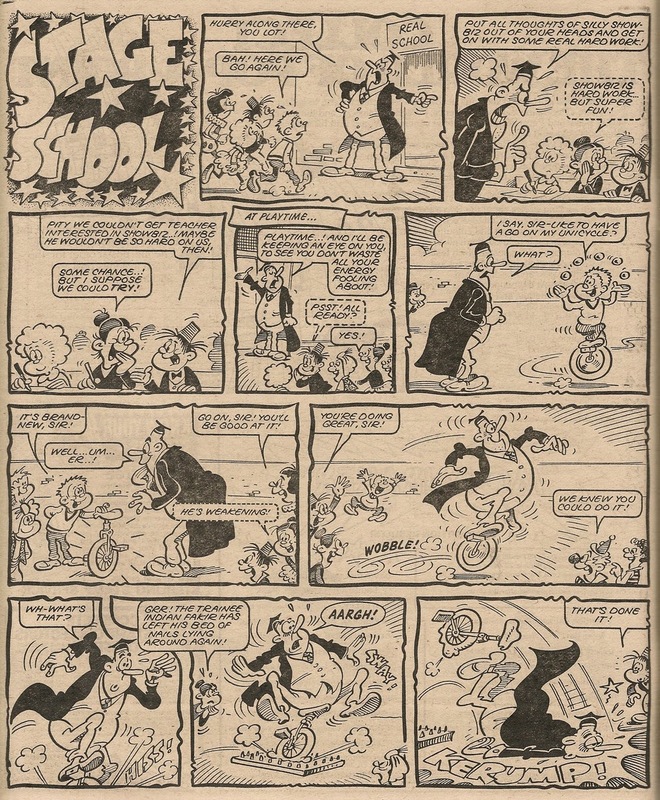 The comic rounds off with a new strip elevating Cheeky's mollusc mate to become the star of his own feature. The two new strips which commenced last week (The Gang and Stage School) are joined by Snail of the Century to complete the 'new look'. 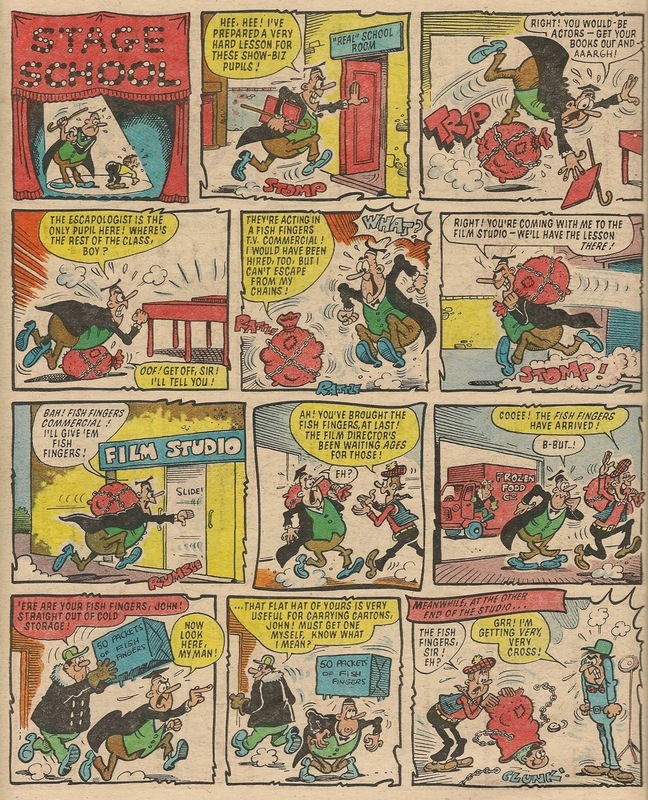 It would seem Snail's debut in his own feature was delayed by 7 days due to the presence of a colour advertisement on last week's back page. Mike Lacey delivers 8 Cheeky's Week elements in this issue, a figure which includes Mike's reprinted cover art as one element (but the 2-page Saturday is also counted as a single element, so it kind of compensates), with Frank McDiarmid supplying the artwork for Snail of the Century, a new addition to the Cheeky's Week roster as of this edition. 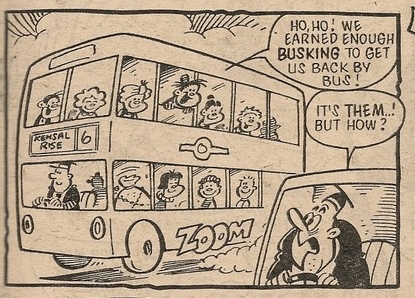 However, Frank's contribution of a Cheeky in the final panel of Saturday is not included in the count. 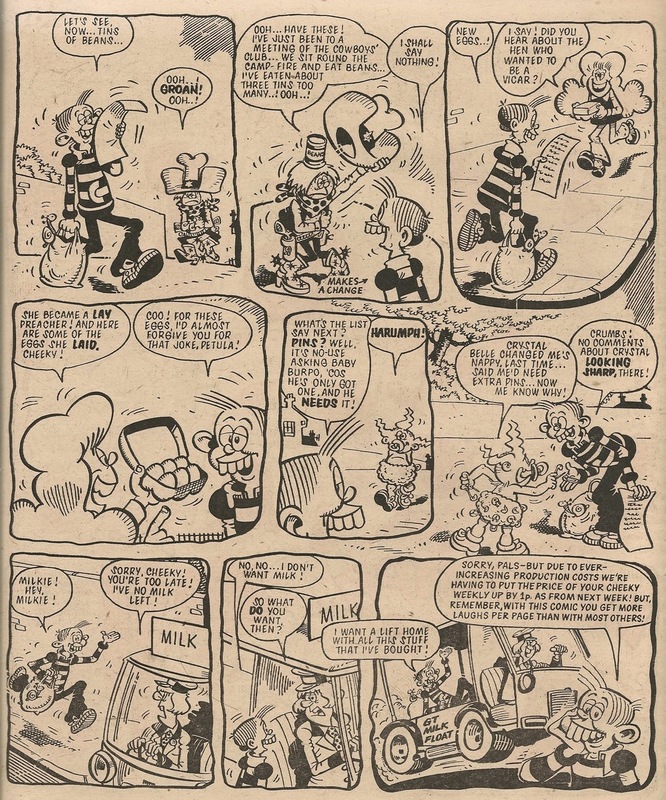 In the same issue Cheeky, along with the rest of The Krazy Gang, was involved in fruit-picking fun. 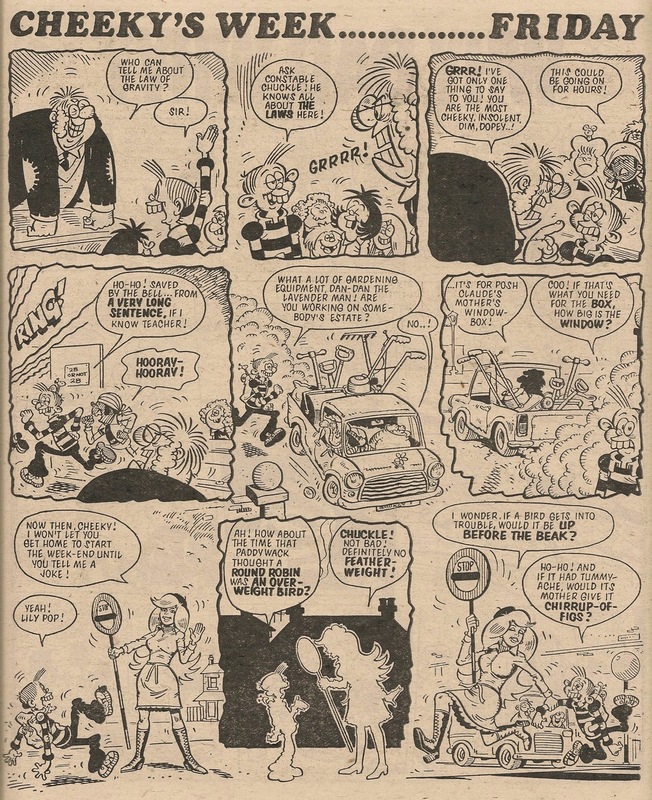 One of the many pleasures of being a comic enthusiast is the unexpected 'ghostings' one occasionally encounters - it's always fascinating to see how one mighty wielder of the pen will depict characters who have a strong connection to another luminary of the visual arts. 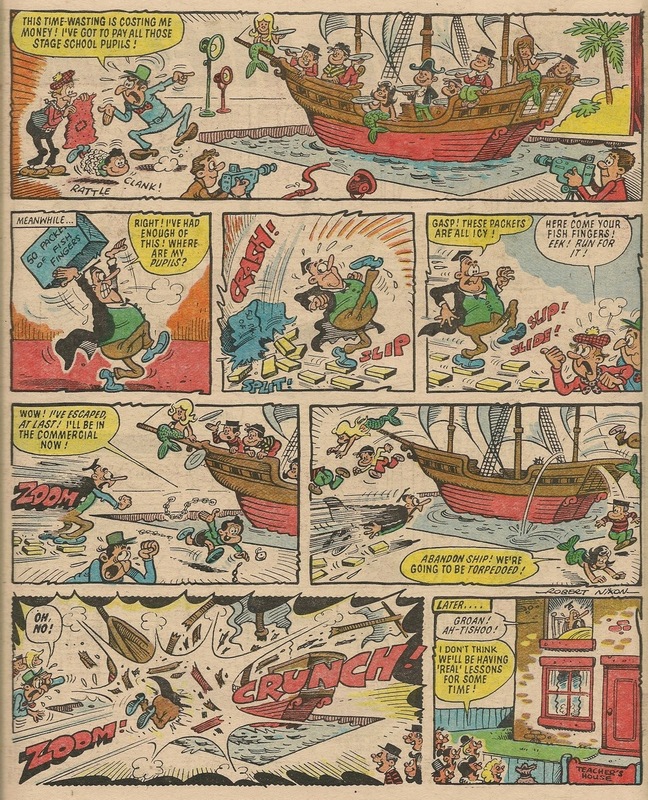 Over at the ever-excellent Kazoop blog Irmantas has posted some superb colour work by Frank McDiarmid on Kid Kong. Do yourself a favour and head on over to experience this rare treat. 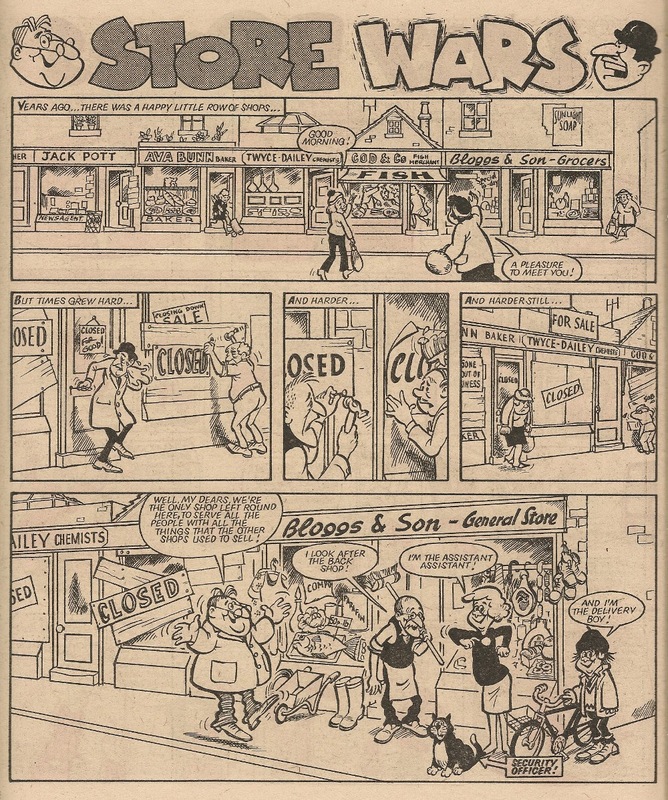 Store Wars, a rollicking tale of retail rivalry, made its debut in Whizzer and Chips dated 05 September 1981. 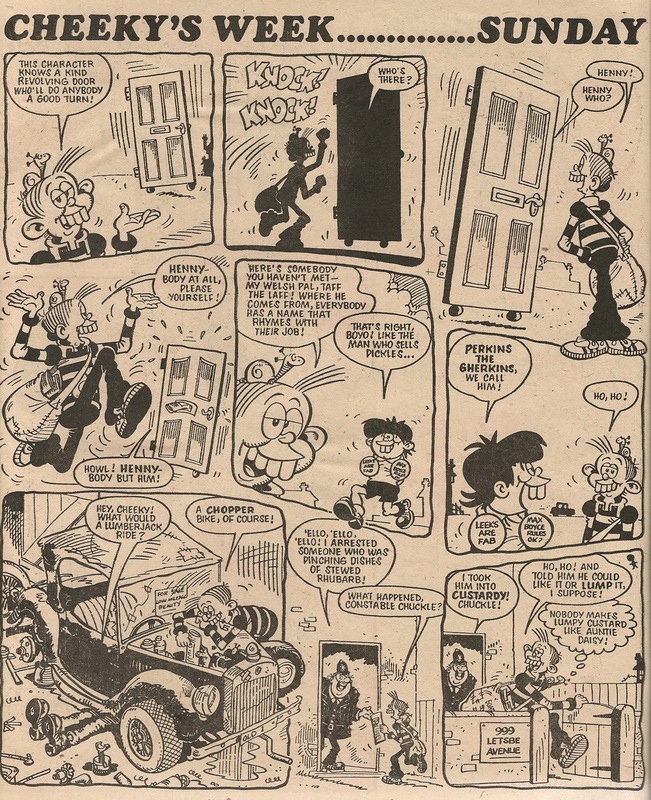 Rather unusually for a humour strip at that time, the feature's initial instalment ran to 3 pages (and the fourth panel contains an image of utter despondency, the like of which I've never seen in a kids' humour strip). 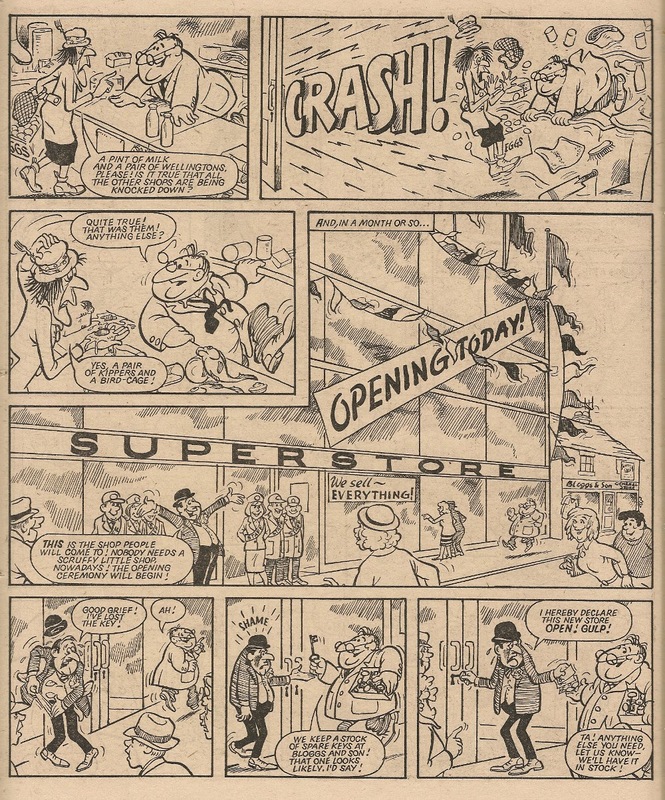 For many years I was unable to put a name to the artist who first drew the strip (artwork duties on Store Wars were eventually passed to Jim Watson and then apparently Jimmy Hansen although I don't recall that myself). In latter years I came to associate this artists's work with the name Doug Goodwin. 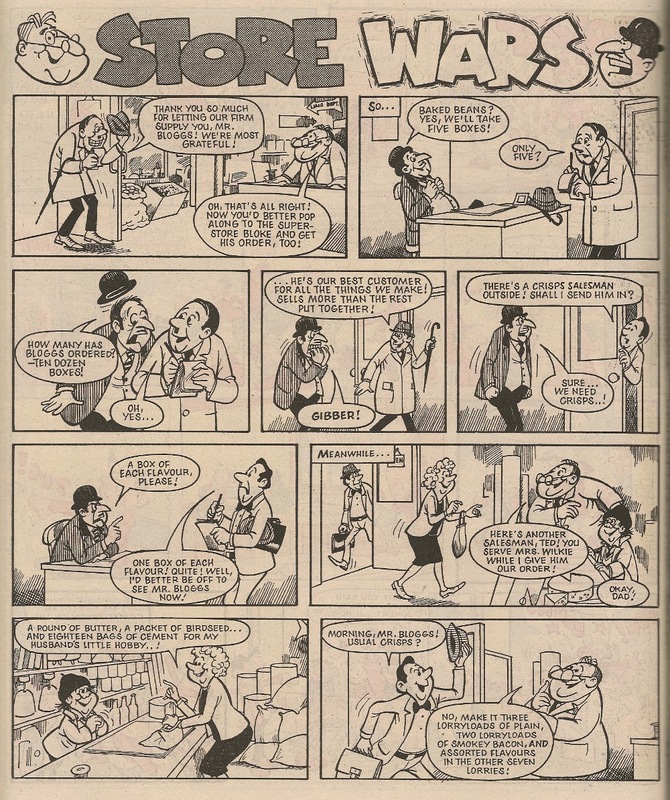 I wasn't the only one to make that connection, as evidenced by the Wikipedia entry for Store Wars. I think we can all agree that this artist is the same person who drew the first episode above. 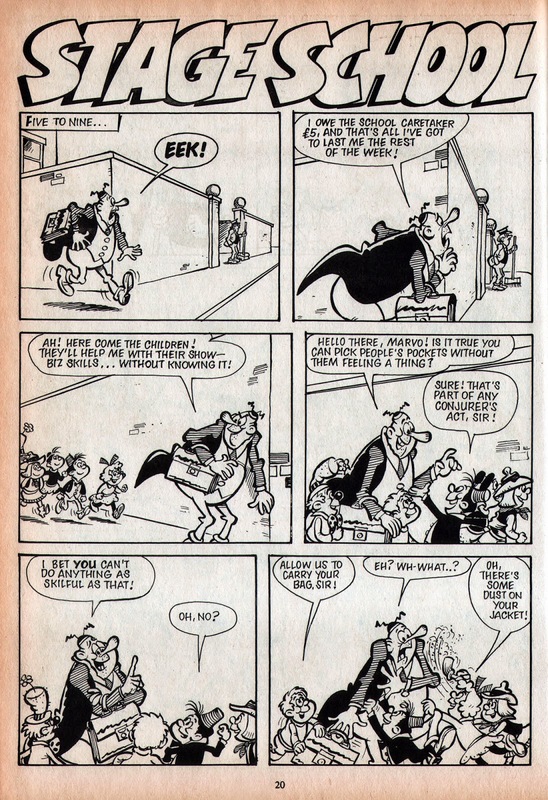 I must have read the letter and reply when I bought the comic in 1986, but unfortunately over the years the artist's name evidently exited my brain via a gap in a bunch of neurons. 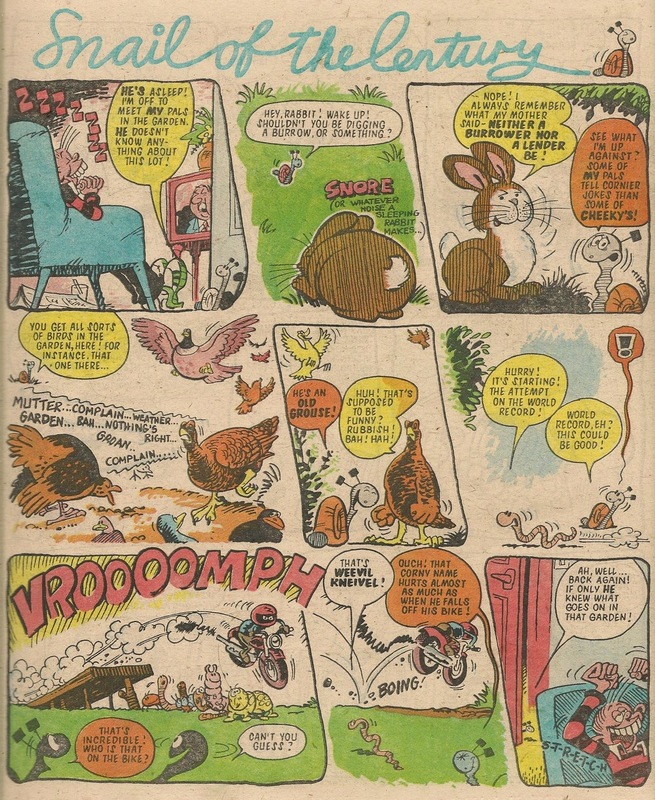 Sadly, a quick online search doesn't turn up any info regarding Doug Jensen, comic artist, although there is an animator of that name who was credited with work during the 1970s. If anyone has more details please get in touch.